This multi-format video scaler is designed to provide simplicity and convenience for legacy RGB image, HD video and computer video image conversion. It is an all-in-1 solution for RGB, PC VGA and HD component video resolution scaling up/scaling down and video format cross conversion. This PC VGA and RGB video converter/scaler automatically detects the input video resolution, which can either be legacy 15Khz CGA RGB, VGA or component YPbPr format. The built-in scaling functionality allows users to alter the output resolution that is compatible with the destination display or projector. The output resolution and refresh rate is manually selectable via push buttons and OSD Menu. With this unit added into your home theater setup, users can connect their computer to a HDTV display via the component cable connection for big screen presentation or or connect an arcade game machine or component video device such as DVD or Blu-ray player to VGA monitor or projector for display. This high-performance analog RGB RGBHV video processor is great for all applications related with HD component video and computer applications with flexible output choice for LCD projectors, Projection TV systems, Home Theater systems, LCD/TFT/CRT monitors, LCD TVs, Plasma or HDTV displays. All HDTV video interconnect features that you will need from home theater to the computer video entertainments are seamlessly packed into this device with cinema quality video for an exhilarating home theater experience. This unit can also be easily daisy chained with all other video switchers, matrix or splitter for further distribution and integration, resulting in large-scale HD setup. This unit can handle your HDTV and PC applications nicely with flexible video signal cross conversion between CGA, VGA and component RGB video input. It can output in HD format for component video output or progressive scan format for VGA RGBHV output. For HDTV component video input or output, a Component to HD-15 pin adapter cable is supplied. 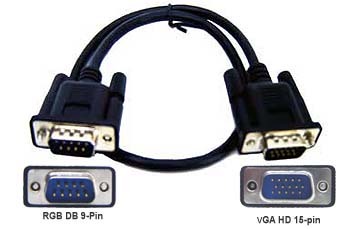 For VGA input or progressive scan output, a HD 15 pin VGA cable is supplied for connection. An important function of this scaler unit is to upgrade the older 15Khz CGA type RGB video signals from sources like arcade game boards to high-resolution VGA or component video output for use with TFT monitor, LCD panel, projector or HDTV set. The video displays for the older RGB sources are quite hard to get nowadays. This converter provides the rightful solution for converting the 15Khz RGB type CGA signals to modern VGA or component video signals. Glitch-free conversion with high resolution output display of sharp frames and fine pixels. 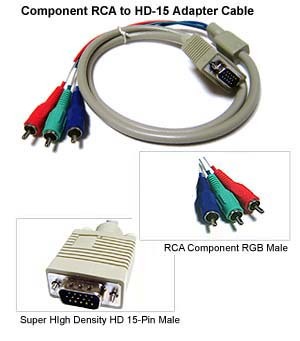 Legacy RGB devices including arcade game boards or older gaming computers such as Amiga, Atari, etc with compatible CGA type signal can be up converted nicely at high VGA or component video resolution for displaying on LCD monitor, projector or LCD TV via VGA cable or component video cable connection. Great replacement display solution for those older CGA type RGB equipments. The RGB input can be RGBHV, RGB H+V or RGsB(sync on G). [Note]: This converter is not an universal solution for all legacy RGB signals. It is designed specially for the standard CGA type signal. Therefore the horizontal and vertical frequency of the CGA type RGB input must have either Hf=15.734kHz with Vf=60Hz or Hf=15.625kHz with Vf=50Hz so this video scaler can work correctly for those analog RGB type signals. One of the most common application for this unit is for displaying computer screen on a HD TV display for larger screen display, any type of HDTV that has component RGB input and accepts HD signal formats like 720p, 1080i or 1080p. This is a great video scaler that can help turn computer VGA output into component YPbPr or YUV format at HD resolution. A commanding necessity for high definition PC gaming, web TV, trade show, business presentation, home PC entertainment and other computer graphical applications. Maximum component video output resolution is 1080p. Another common application for this product is for displaying HD component video type output from satellite, cable box or other HD sources on a VGA display such as LCD monitor, projector, LCD TV or other flat panel display with VGA terminal. This component RGB video to VGA scaler can support all different types of YUV or YPbPr type RGB inputs with different resolution including 480i/480p, 576i/576p, 720p, 1080i and 1080p. Its maximum VGA output resolution is 1920x1200 pixels. This VGA scaler can be used for resolving the compatibility issues between computer output and LCD monitor or projection displays. There are events that the computer VGA outputs can not be supported by the VGA monitor or projection display used. This VGA scaler helps PC/Mac users up convert or down convert their computer output resolution in an external way to level that can be accepted by the VGA display used without spending extra money on upgrading existing graphic card in the computer. Its VGA output level can be manually selected such as 640x480, 800x600, 1024x768, 1280x1024, 1280x800, 1600x1024, 1600x1200 and up to 1920x1200 pixels. This unit is also a component video scaler for scaling up or down the component RGB input to higher or lower component YPbPr video resolution, which greatly helps those users with incompatibility issue between their HD devices and HDTV displays or beneficial for applications that needs to up convert the component input to higher HD resolution and enhancing the picture quality. Maximum component video output resolution is 1080p from the component video input. Color adjustment for Red, Blue and Green color level control. Overscan mode used to ensure no black band around the screen border. Underscan mode used to ensure full picture content presented within screen border. Video output resolution selection: user can select VGA output from 640x480 to 1920x1200 pixels or HD component YPbPr output from 480i to 1080p. On-Screen Menu positioning, background and display time period. This VGA Component HD video scaler has non-volatile system memory built in to retain all users settings even when the power to the unit has been turned off. Once powering off or experiencing power outage, it will perform the signal conversion as configured before with all the parameters retained. No need to re-configure the unit again. All-in-1 video format converter and scaler solution for CGA RGB, VGA/RGBHV and HD component video feeds. Supports RGB inputs in the format of RGBHV, RGB H+V or RGsB(sync on G). Supports standard CGA type RGB signals that have 15K.62/15.73hz(Hf) with 50/60hz(Vf). Supports legacy computers such as Amiga, Atari, etc with compatible RGB output timing. Great replacement display solution for those older CGA type RGB equipments. Supports video format cross conversion between VGA and component video. Supports VGA to VGA up/down scaling and component video to component video up/down scaling. Converting computer VGA pixels to HD component video for big screen display. Scale PC or HDTV resolutions up or down to fit your needs. Selectable VGA or component video output resolutions with resolution up to 1920x1200 or 1080p. Converting component video to VGA type for LCD monitor or projector displays. Displaying computer screen on a HDTV display through component video connection. Auto detection of video input format and resolution. Instant video output with no lags. Motion video adaptive de-interlacer with smooth low-angle edge for high video definition viewing on virtually any HDTV, Plasma, Digital or PC Display. Automatic 3:2 pull-down and 2:2 pull-down detection and recovery. Built-in system memory for keeping user's last configuration after power-off. Easy on-screen OSD setup menu for input/out format selection, color element adjustment and so on. Universal power supply provided with 110V to 240V AC input with DC 5V 2.6A output.